I'm hoping somebody has some experience here. I'm planing on cooking Turkey for Easter, and I want to slow cook it to give it a nice smoke flavor. A few online sites I've found say the average time is about a half hour per pound. One or two also recommended searing it at 475 for 20 minutes first. Seems like that would block out some of the smoke flavor though. So has anybody done this before and are there any tips, tricks or pitfalls I should be aware of? Last edited by rms827 on Thu Apr 12, 2018 3:27 am, edited 1 time in total. Can't offer any pellet advice but as for crisping the skin first, I would NOT go that route imho. I've done quite a few Turkey smokes over lump and found that cranking up the temp in the end works best for crisp skin. I'm sure you will get good advice from the pellet users on here as they have them figured out very well. I've done a few Turkeys in my pellet.some turned out good, some not. Best luck I've had was the ones I've brined and spatchcocked. You'll probably never achieve real crispy skin unless you cook it at high heat like 350 plus. But as you know the higher the heat the less smoke out of a pellet smoker. Might just as well do it in the oven. I read somewhere to blaster mayo on the skin for crisby skin. I tried that once and ended up with rubbery black skin. Try drying off the bird after it comes out of the brine and letting it sit in the fridge uncovered overnight before putting it in the smoker. This seems to help make for somewhat crisber skin. I'll set my grille on xtreme smoke at 225. 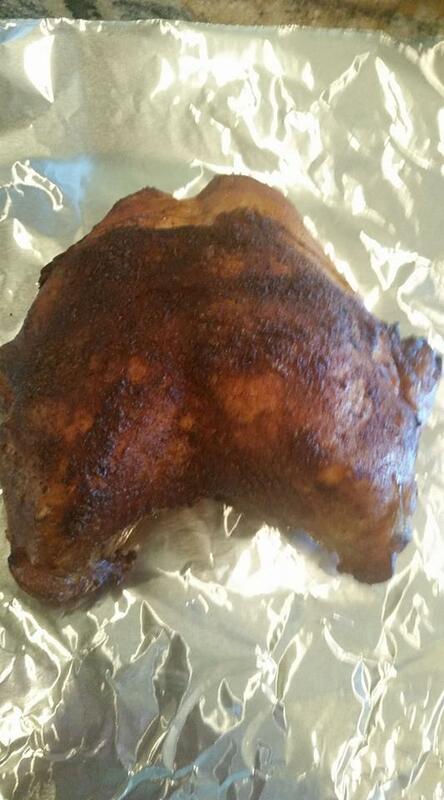 I let the bird roll at that temp for a couple hours or more until I think it's got enough smoke. To finish it off I crank up the grille to 275 or 300. Any higher then 300 I've noticed the skin will start to pull back and the meat will start to crack open, not exactly eye candy. I always wrap my birds tight in foil whether it be Clucker or Turkey immediately after they come out of the smoker. Wrap in foil then some towels and set the in a small cooler. I'll let them rest for up to a hour or two before serving. The rest in a cooler really seems to help for moist pull off the bone meat. I inject my turkeys instead of brining them. I feel it gives me better results. There are a lot of good injections on the market. I rub down with olive oil very lightly, then add rub. Again, there are many good ones out there. 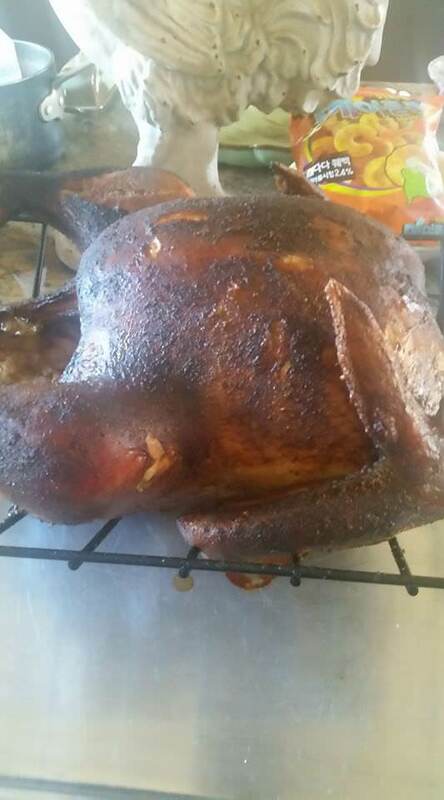 I smoke my turkey at 275F, and it takes 20-25 minutes per pound, but I go by the breast meat temperature (165F). I use apple and cherry pellets, and use an A-MAZE-N Smoker for a good smoke, without overdoing it. If you like, you can cook to 160F, then crank up the heat to 375F to crisp up the skin to your liking. Thanks Bill and Okie. Definitely some good advice there. I've done whole turkey breast before (skinless) and had good luck. A full turkey will be a first for me though. The thing with the mayo... I recall hearing that before, and with the same results, LOL. I think I'll learn from Bill's experience and pass on the mayo. I've never Pelletized a Gobbler. I only Inject and Beer Can my Birds, with pleasing results. Never tried it but I may some day, just out of respect for his memory. Well, at this point it's all over but the clean up. Everything turned out amazing, and I credit much of my success to the advice I got here. That's the turkey right before carving. Let's take a step back though... Here's what I did: After thawing the turkey in the fridge, I brined it for 18 hours, then dried it off, oiled it and put some rub on it. Into the fridge overnight, and then onto the Rec Tec at 240 (yes 240, not 250) to slow cook it an get it some smoke. About 5 hours later, the IT hit 140, and I cranked the grill up to 275 to finish it off. 265 and off it goes. Wrap tight in foil, stuff in cooler for what worked out to be almost an hour and a half while the rest of dinner was finished. Pull out, carve and enjoy. The only flaw was that it was just a little on the salty side. Too long in the brine. I've brined birds that long before, but they were not completely defrosted like this one was. Lesson learned. Everything still turned out great though. white meat turned out just as good, but apparently I forgot to grab a pic. How much salt you using in your brine. I normally brine all our feathered friends. Whole cluckers get brined up to 12 hours. Turkeys 24 hours or more. Never turn out too salty. I use a cup of Kosher salt and a cup of brown sugar and just enough water in the container to cover the bird. I do give them a good rinse tho after coming out of the brine, pat dry then a healthy rub of my fav seasonings. I typically butterfly them or just cooked breasts. I don’t brine them anymore as I don’t like the texture change. On breasts I cook till 150-155 and wrap it in a cooler for an hour or two. I actually normally use Fire and Flavor brand brine mix. It has juniper, rosemary and a ton of other good seasonings in it. This time I used World Market brand brine mix. More salt in it, but it's what was available. Next time I can't get Fire & Flavor, I'll make my own. Nice thing is the kit comes with a giant ziplock bag to brine the bird in. Cuts way down on the mess.